The whole ICEC Team visited the Skärholmen area as part of a field trip in June 2014. For some impressions from the trip, visit the blog post. Skärholmen (21703) is located in the south western part of the City of Stockholm, and is part of the greater borough (city district) of Skärholmen (SDO24). Skärholmen is located approximately 14 km from the City Centre (the City Hall) and 22 minutes by public transportation (the underground). The landscape is slightly hilly with a dale where the residential areas are located, and with lake Mälaren to the west. There is a large commercial centre in Skärholmen. The neighbourhood is delimited to the east by the motorway E4. There are however connections to the vast commercial area on the other side of the motorway by tunnels and bridges (in the municipality of Huddinge). That commercial area is the largest commercial area in in the entire Stockholm region. To the north, there are green spaces and then another neighbourhood (Sätra), though not entirely adjacent. In the southern part of Skärholmen, there are green spaces and another type of residential area consisting of terrace houses that are privately owned. The space between the two residential areas (the latter one and the multifamily housing area) is under physical urban design development, so as to promote connection. The Skärholmen neighbourhood is integrated with the neighbourhood of Vårberg to the west, which is also a residential area developed in the late 60’s and the 70’s. All together, the land area (green spaces included, water excluded) is 1.94 km2. The master plan for the area was established in 1963, and the entire area (covering Skärholmen and the adjacent neighbourhoods of Sätra, Bredäng and Vårberg) was constructed from 1964 to 1968. The commercial centre area was finalized in its current form in the beginning of the 1970’s. The area is a school book example of the trends prevailing at the time: zoning for housing and commerce and green spaces, and traffic separation with separate pedestrian paths all leading to the commercial centre and the underground station in the middle. Multifamily housing are thus located close by to the commercial centre and then furthest away are single family housing units located. There are all in all 3 280housing units, whereof 2 556 units in multifamily housing, and 724 single family housing units (or terrace housing units). The owner categories of the housing units in multifamily housing are372 condominium/private ownership and the rest 2 184 rental units (whereof 1 619 owned by public limited housing companies). Given its location, there is plentiful of access to green spaces and also the lake Mälaren. The neighbourhood is well connected through the public transportation system thanks to the underground connection. There is very easy access also the major road network via the motorway E4. 31 December 2012, the total population was 8 280, whereof 4 075 women and 4 205 men. Since 2003, the neighbourhood has increased by 560 inhabitants. Skärholmen as a more even shaped beehive shaped demographic distribution than the City of Stockholm as a whole, reflecting its position as a family oriented area. 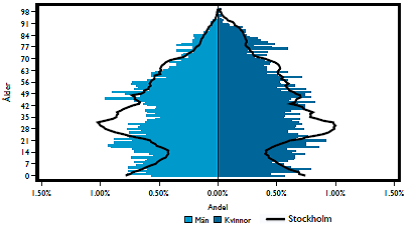 Educational levels in the neighbourhood of Skärholmen differ substantially from the overall City of Stockholm pattern; as many as 27.6 per cent of the residents, 20-64 years old, only have basic education (ISCED 1-3), while those with tertiary levels (ISCED 5-6) are 29.1 per cent as compared to the City average of 55.7 per cent. In terms of employment patterns by group of trades, there are only marginal differences from the overall City. The major differences are that the residents of Skärholmen are overrepresented in transportation, hotel and restaurants, and health care, while underrepresented in information and communications, and public administration. The employment rate is 57.9 per cent (2011), (62.1 per cent for men and 53.7 for women), which is significantly lower than the City average, which is 77 per cent. Unemployment rates are also substantially higher in Skärholmen than in the City of Stockholm as a whole: 6.8 per cent versus 3.4 per cent. There are only marginal differences between men’s unemployment rates and women’s (2011). Income levels reflect employment patterns and education levels. The average income is SEK 200 600 in Rågsved (220 700 for men and 181 000 for women), whereas 339 200 in the City of Stockholm (2011). 31 December 2012, 79.4 per cent of the residents in Skärholmen neighbourhood had a so called foreign background, i.e. either born abroad or born in Sweden with both parents born abroad. Of the residents with foreign background in Skärholmen, almost 7 of 10 are of either Asian or African descent. Especially, the Asian group predominates, constituting 52.5 per cent. The largest foreign born per country of birth are: Iraq, Poland, Turkey, Greece, former Yugoslavia, Iran, Somalia, Finland, Chile, Bangladesh, Ethiopia, Bosnia and Hercegovina, and Syria. In 2012, 1 064 individuals moved in to Skärholmen, and 1 023moved out. Appriximately 44 per cent of these movements are registered as movements inside the City of Stockholm, i.e. from or to another neighbourhood within the City of Stockholm. Direct international movements are few: 11.7 per cent in movers, and 3.5 out movers respectively. The City Council has adopted a vision for JÄrva 2030, which covers the area in the north western part of the city including the district of Kista-Rinkeby and Spånga-Tensta. It is based on the city’s vision of ‘A world-class Stockholm’. There are four main strands: housing and urban renewal where the aim is to increase variation in the housing stock and to promote a more varied proprietor structure; safety through promoting trust and pride; improved education and better language education through investments in schools and in competence centres and coordination of public services, and finally; create more jobs and entrepreneurship through, among other things, improved unemployment services.